If you are a landlord or are choosing multi unit mailboxes for a dorm or office, you may not know exactly what type to choose. Multi unit mailboxes are ideal choices in many environments. They are well made with high-quality materials and can allow you to fit a multitude of boxes into a relatively small area. Made with security in mind, they are very capable of keeping any mail safe. The horizontal mailbox systems work great if you are trying to fit many mailboxes in a small area. They often come as locked boxes with keys. They can usually be mounted on walls or freestanding, depending on your needs and the particular style you choose to purchase. 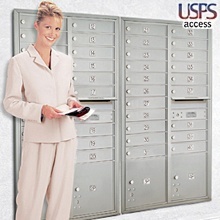 If you are looking for outdoor multi unit mailboxes, cluster mailbox systems are best. They are freestanding units offering many mailboxes in one cube system. Each box is stacked on top of one another and connected with a poled system. They are extremely secure and are often used for new neighborhoods or apartment communities. Those landlords or office managers needing to offer more space to each mailbox user may want to seek out a vertical mailbox system. These allow for larger packages to be delivered. Of course, they also take up more space. Overall, it’s important to think of the area you want to put the multi unit mailboxes in before buying. Measure the intended area and count how many boxes you’ll need. Then look at systems to see which one would best fit in your intended area of use.